Lately, I have been feeling quite nostalgic and I think that it has a lot to do with seeing posts from family and friends in different parts of the country that I miss. In October of last year a spent nearly the entire month away from home, in New York and Michigan visiting family. I had some really great times there and I want to go back SO badly. It probably doesn’t help that I have been listening to Ryan Adams a lot, and that one of my cousins and I share an immense love for him. I think I may just be getting stir-crazy, it has been quite a while since my last trip/adventure. Hopefully, soon I’ll be visiting my younger sister in Phoenix who has been living there for a couple of months. I’ve already picked out some of the vegan places I’d like to check out. 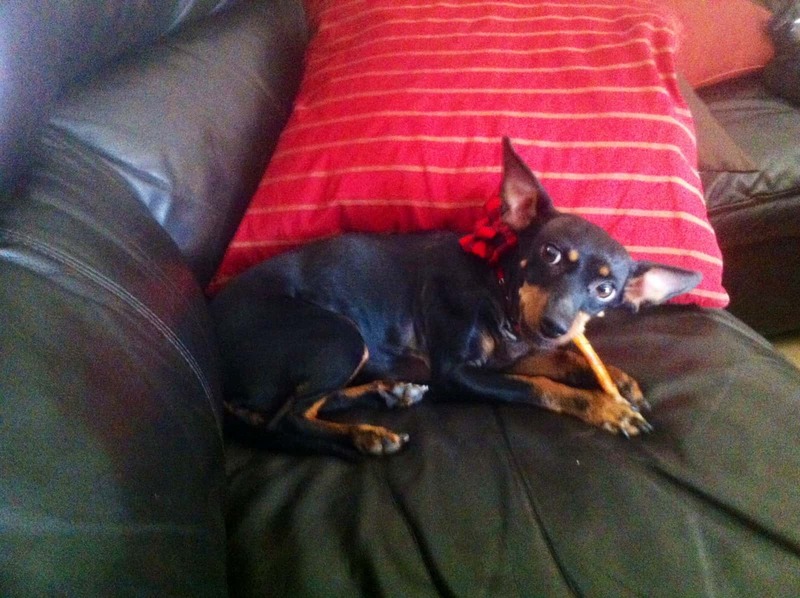 😉 Plus, she just adopted this adorable Manchester Terrier! How cute is she, with her new little bow? Adorable, to say the least. But, because I can’t travel at all right now, I’ll make the best of being at home and staying comforted. Really, what’s more comforting than soup? Not much in my book. And what better way to start off a filling meal than with a warm bowl of miso soup? Of course, this is a little elaborate in comparison to the traditional miso soup served with sushi, but that’s what makes this recipe special. If you want to have this as a full meal instead of just an accompaniment, add some firm tofu for its protein content. This filling, comforting, miso soup makes a great start to any meal. Place the onions into a large pot over medium heat, along with the 2 tbsp. of water and cover with lid. Stir the onions every 2-3 minutes and add the garlic in once they start to turn clear. After roughly 7-8 minutes, add the mushrooms to the pan and cover with lid, stirring occasionally until they reduce in size and become soft. Carefully pour the water into the pot, stir the miso paste in along with the kelp noodles. Cover with lid and bring to a simmer over low-medium heat for 10 minutes. Once the noodles have relaxed, add the seaweed pieces, hot sesame oil and liquid aminos into the pot. Stir a few times and serve warm, and perhaps with some chili paste or sriracha! So, stay warm with this easy-to-make soup and enjoy it while watching the gorgeous Fall sunsets. this sounds incredible! I love miso… we make it here all the time! I have noticed that’s a theme in some of your recipes, like the ice cream! Sounds so interesting! Thanks, Terra! I absolutely love mushrooms and right now I have a surplus of them! Awww the Manchester terrier is super cute! And this bowl of soup is so comforting! It’s been getting so cold out here so a piping hot bowl of this with a drizzle of Sriracha is pure heaven! I’ve only been to Phoenix once, but I don’t even think I was vegan at the time. For shame! I hope you’ll have a blast when you get to go. The pup is super cute, and the shroom soup looks delicious! I love a miso mushroom combo. This looks so delicious on a cold winter’s night! This soup looks amazing and as I absolutely love miso soup this recipe is just perfect for me! I just made this with a few alterations, but it was awesome! I used organic mushrooms, onions, cauliflower, broccoli, and organic spinach..I also used toasted sesame oil..It was delicious! Thanks for an awesome recipe! My non vegan children even loved it..This will be made at least 3 times a week in my household. Maybe you know something I don’t, but can I suggest not adding the miso paste until the soup is otherwise finished and off the heat? Since it’s a live culture item, I believe a 10-minute simmer will destroy the “good bugs” that are the main reason to consume miso. I’ve always been given to understand that you only add the paste once you know you won’t be bringing the soup back up to a simmer or beyond. Thanks for the recipe – am going to make a variation of it tomorrow. Best regards!